Our maple wood stock designs for marking soft clay are made right here in our shop in Whitewater, Wisconsin, USA. 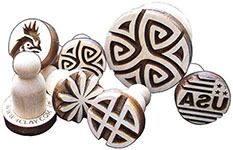 Drop down list to choose the size between 5/8" and 2-1/2" for each design. 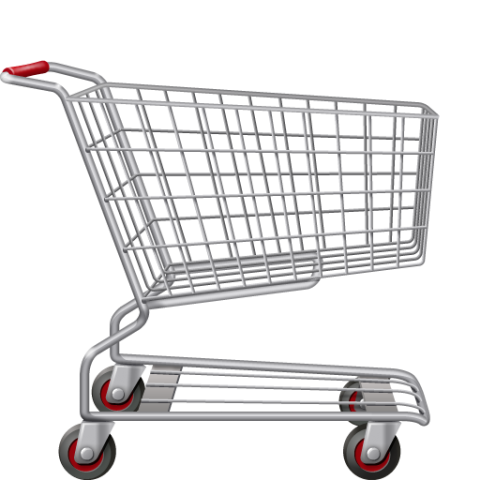 We stock the standard 1" size and make the other sizes to order. Production time is about 24 to 48 hours for sizes we don't have in stock. The stamps are cut so the white areas shown are raised on the stamp surface and will be your final mark that will press down into the clay. Another way to think about that is the internal black areas will lift up towards you. So if a design has a white background and black image inside, that will result in a white circle pressed into the clay and the black image will be a raised clay image above the background shape. All designs are copyright (C) 2009-2019 SOCWELL LLC. All stock stamps are made in house and custom versions are available (by e-mail request) if needed in other surface materials for underglaze transfer, PMC, or ink on paper. 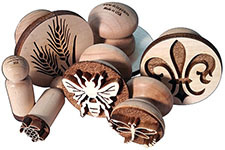 These stamp tools are made of high quality laser cut maple wood and can be used for many years of creative work. Depth of the mark is about 1/8" (about half the wall thickness of a piece made on the wheel) and made for ceramic clays. A single shipping charge applies to all orders no matter how many stamps you order, so additional stamps ship for free. 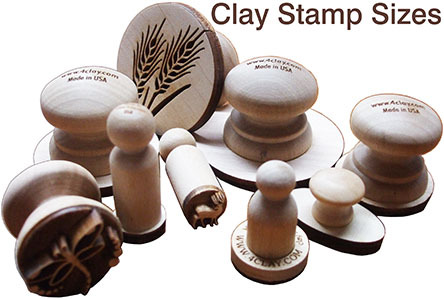 And don't forget, we specialize in custom clay stamps, so if you want us to take one of these stock designs and make it into a custom stamp with your name or initials, we can typically do that very quickly and send you a proof and quote before we make it.